"Great hotel with nice friendly staff"
My wife and I stayed in the hotel for 9 nights in January. The hotel is very well run and both the owners and senior management are very hands on, along with a great group of friendly staff. The hotel is in a great quiet position and sat on a lovely beach with the livelier Port Elizabeth only a $10 taxi trip away in an open back pick up truck serviced by Gideon Taxi service who were also very reliable and very nice guys. The hotel also own a great beach bar/restaurant on Princess Margaret Beach called "Jacks" and a free return taxi trip is offered each day and why not catch a local boat taxi to a floating bar in the bay run by two local lads ! 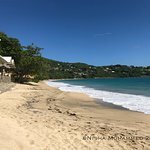 Bequia Beach Hotel is probably the best hotel on the island with two very good restaurants and was a great option to our local holiday spot of Barbados. Room tip: We stayed in a beach front suite room which was very spacious with direct access to the beach. We were there last week of December, very busy time, but the structure is so well done that you never have the sensation of a busy place; the staff is very reactive and supportive; beautiful beach; very good breakfast; the spa has a very high level of services. Very beautiful place, I would have no doubt to come back. 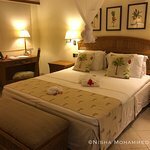 Thank you for taking the time to review us on TripAdvisor forum, it was such a delight to welcome you to Bequia Beach Hotel. Your appreciation will encourage us to do even better, we are delighted to know that u have had a unique experience with us as we love to call it “your home away from home”. We don’t just meet new guest we meet new friends and family. We really look forward to welcoming you back soon. The hotel is tucked a few minutes’ drive away from the “hustle” of Port Elizabeth with a beautiful beach front location at Friendship Bay. The staff are attentive and friendly, and not one person provided anything but excellent service to me while I was there. From the welcome drink and throughout my stay, they made me feel like nothing was a problem, anything I required could be arranged, and all would be well. My luggage was delayed and they actively followed up with the airline and collected it from the Bequia airport for me, even assisting me with obtaining one or two essentials to tide me over until my luggage eventually arrived. I stayed in a Classic room and it was sufficiently spacious, with a mini fridge and tea/coffee station, and turndown service was offered in the evening. The couple of times I ordered room service it came very quickly. There was no TV in my room (nor in any room, I think), but there was WiFi around the property and a reading room where guests can take and leave books. The property is well maintained and the grounds are beautifully manicured. There are several lounge chairs with umbrellas and side tables already in place beachside where one can easily spend several hours relaxing, sipping a cocktail and enjoying the steady sea breezes. 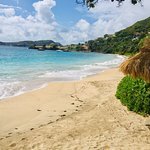 - Unless you are sitting in one of the aforementioned lounge chairs enjoying the sea breeze, you likely will be a target for some of the many mosquitoes that call Bequia home. The hotel does provide repellent and mosquito nets, though. - The rooms are scattered throughout the property, including on the hillside, and there are no elevators. Walking up and down steps to get to my room was not an issue for me but, if someone has mobility issues, that should be mentioned at time of booking to ensure that a suitable room is allocated. - Because of the layout and the climate, there is a chance of getting wet in the event of rain. However, the hotel has several umbrellas available for the use of guests, including in the room. 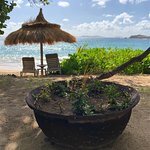 Overall, I had a lovely stay and have no problem recommending Bequia Beach Hotel to others. Thank you for your vote of confidence and for taking the time to review us on TripAdvisor. We are glad that you enjoyed the hotel and the services. This hotel is very comfortable. We got a beachfront suite and everything (mattress, pillows, furniture, shower, tub, etc) were all fantastic. You can tell that the owner thought about details. Fabulous housekeeping service as well - nothing was ever forgotten. Bagatelle restaurant not only has top-notch service, but food to match. They put in effort to accommodate our healthy diets and no order was ever incorrect, despite all our edits. Fabulous wine options as well. The staff is super sweet and you can tell they have had extensive training. Sometimes there’s live music and it really adds to the experience. We went to the Italian restaurant once and it was great, although the menu is super small. It would be great if there were more veggies as ingredients (perhaps a salad) so guests have healthy options but the caprese salad and lobster raviolis were worth the visit. What we loved was that it was totally quiet when we went. The server was sweet. The wine list is not as great as at the other restaurant so be sure to bring a bottle from there if you enjoy nice wine with your Italian food. The beach is lovely as well but there are better places (Princess Margaret and Lower Bay). They have a shuttle to Jack’s restaurant so you could use that if you don’t want to walk. What was great about the beach and pool areas is that you never feel like you have to battle for chairs (we did go when it was only 40% full, though). The front desk was sweet and helpful throughout our stay (setting up taxis, restaurant reservations, flight bookings, etc). Internet only works near the reception building. It wasn’t a big deal to us but could be great to know if you need a lot of access. -They allow smoking at the bar, which is right in front on the restaurant. If someone is there smoking you will definitely be subject to secondhand smoke (such a huge detail that management really needs to address). Really sad that a top notch hotel doesn’t protect its guests and staff from that. This is something that they will need to address at some point (it’s almost 2020- evidence on the effects of secondhand smoke have been around for decades). -We were not fans of the theme nights; the regular menu was awesome and the food on theme nights wasn’t as great (not bad, but not as great as the usual). I think these nights are when the main chef is off. -A lot of guests here are smokers, so make sure you are not placed in a room with any close by if possible. We saw a few smoking in their rooms (the doors were wide open so I’m guessing they thought that made it ok). -Minor item: if you have a midday flight, be sure to ask for water. They will make you sandwiches to go but don’t give you drinks. The airport doesn’t sell any and planes have none on board, so you might have to wait for hours to be able to purchase any. Thank you for taking the time to share your great experience on TripAdvisor, we appreciate your feedback, it is most encouraging for the team to know that all made a difference to your experience. We apologize that your guest experience was not up to our usual standard. All our rooms have a strict no-smoking policy, we do allow smoking in a designated area around the bar, however most often the prevailing direction of the breeze ensures other bar and restaurant guests are not inconvenienced. We would have gladly re-located your table in the restaurant or room to accommodate any requests. We have recently undertaken a significant upgrade to internet connectivity within the resort, doubling the down and up-link speeds as well as refurbishing access points ensuring there is one in all of our rooms. We are sorry we were not given the opportunity to rectify this matter whilst staying with us. At Bequia Beach Hotel, we are thrilled to hear that you enjoyed the well-kept facilities, providing top-notch customer service is of the utmost importance to us. We are committed to consistently providing efficient and discrete service to our guests, their appreciation and acknowledgement is always our greatest reward. We had the breakfast buffet here while meeting family on Bequia. 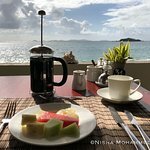 Delicious choice of cooked and fresh foods, tasty omelettes, not cheap but what a beautiful setting with the Grenadines to admire. Great friendly service from the happy smiley staff, definitely recommended!